In case of inclement weather, please check our Facebook page for cancellation updates. Kendo is $35 per month for 1 class per week. 601 Calvert Street, Unit "D"
The Japanese art of fencing is called Kendo (the way of the sword). While today kendo is practiced as a form of quasi-combat, it also serves to develop an indomitable spirit and a deep philosophical outlook on everyday life. In Kendo, two armored opponents face one another with their shinai (practice swords) clutched in both hands. Points are awarded for the precise blows delivered to the head (men), wrist (kote), or torso (do), and for thrusts to the throat (tsuki). The spirit of the bouts are as ritualistic as those duels fought in feudal Japan. 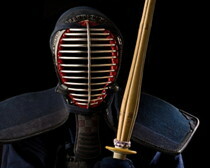 Though it is a highly strenuous activity, kendo is also a means to strengthen the mind and the will to improve oneself. It is this aspect of kendo that attracts many of its most devoted practitioners. A Kendo bout with skilled opponents is an intense experience. For a moment in time concentration is absolute, conscious thought is suppressed, and action is instinctive. Such training develops powers of resolution and endurance under pressure which frequently affects the serious student in his or her life, beyond the confines of the training hall. Because Kendo is steeped in tradition, formality, and honor, we will always seek the direction and guidance of our devoted teachers. Lincoln Budokan is affiliated with the U.S. Kendo Federation and with Umemoto Hiroshi Sensei and Iwakabe Hideki Sensei who oversee the Rocky Mountain Kendo Federation.